Prof. Kontopoulou obtained her Ph.D. and Master’s degrees from the Department of Chemical Engineering at McMaster University in Hamilton, Ontario, Canada, and her Chemical Engineering degree from the Aristotle University of Thessaloniki in Greece. She became a faculty member of the Department of Chemical Engineering at Queen’s University in 1999, where she is currently Professor and Associate Head. She is recognized internationally for her contributions in material development through polymer blending and reactive modification for a wide-array of industrial processes, such as automotive applications, rotational molding, thermoplastic foaming, and conductive polymers. She has co-authored more than 100 scientific publications, including peer-reviewed journal papers and conference proceedings. She has been the President of the Canadian Society of Rheology (2013-2017) and Vice President (2008-2012). She has served as technical program committee chair, organizer and moderator for major international scientific conferences and has delivered invited and keynote lectures in academic and industrial settings. She received the 2010 Morand Lambla Award of the Polymer Processing Society, awarded in recognition for achievements and creativity among young researchers in the polymer science and technology field. She has served as guest editor for a special issue on Reactive Extrusion, in Macromolecular Reaction Engineering, published in February 2014. She is the Editor for the Americas of International Polymer Processing. Thermoplastic Olefin Blends and Thermoplastic Vulcanizates. Polymers are fascinating materials, which can deliver various functionalities. They are amenable to structure manipulation, which provides infinite opportunities to combine properties. This makes them among the most versatile materials available. Manipulation of the structure of polymer compounds through processing can provide a wide range of commodity, specialty and high-value added applications in many sectors, including the manufacturing, structural, biomedical, and various high-tech industries. Prof. Kontopoulou’s group conducts research on advanced polymer technologies, including polyolefin and bioplastic compounds, polymer nanocomposites, thermoplastic foams, and electrically conductive composites. Our aim is to design multiphase polymeric materials with tailored structures, such as compatibilized compounds and nanocomposites with improved processability, multiple functionalities and fine-tuned properties. Rheology is used extensively as a tool to characterize the structure of the materials that we produce. Rigorous structure-property relations are established through microscopy and detailed mechanical testing analysis. For more details click here. Reologica Controlled Stress Rheometer, equipped with parallel plate, cone and plate and bob and cup fixtures. Testing facilities available in the Materials Characterization Lab of the Department of Chemical Engineering, including GPC DSC, Advanced Polymer Analyzer, TGA, Mechanical Property Characterization, Dynamic Light Scattering. NSERC (Discovery, Discovery Accelerator Supplement, RTI, CRD, Strategic Grant and Strategic Networks, Engage); Ontario Centres of Excellence (OCE); MITACS; Canada Foundation for Innovation (CFI); Ontario Innovation Trust (OIT); Ontario Research Fund (ORF). Industrial partners: E.I. DuPont Canada; Solegear; Alcereco; Novelis; ExxonMobil/Imperial Oil; American Selenite. 2015 Way Memorial Trust Award, of the Faculty of Engineering and Applied Science, Queen’s University. 2010 Morand Lambla Award of the Polymer Processing Society. Nominated for 2004 Frank Knox Award and 2010 Alumni Award for Excellence in Teaching (Queen’s University). Recipient of a Discovery Accelerator Supplement by the Natural Sciences and Engineering Research Council of Canada (NSERC) in 2011. Tiwary, P., Gui H., Ferreira, P.L., Kontopoulou, M. (2016) “Coagent modified polypropylene prepared by reactive extrusion: A new look into the structure-property relations of injection molded parts”, Intern. Polym. Process., 31(4), 433-441. Osazuwa, O., Vasileiou, A., Kontopoulou, M., Docoslis, A (2015). Electric-field induced filler association dynamics and resulting improvements in the electrical conductivity of polyester/multiwall carbon nanotube composites”, Polymer Composites, published online;DOI: 10.1002/pc.23724. Petrie, K., Kontopoulou, M., Docoslis, A. (2016), "Non-covalent compatibilization of polypropylene/MWCNT composites using an amino-pyridine grafted polypropylene matrix”, Polymer Composites, 37(9), 2794-2802; DOI: 10.1002/pc.23475. Waffle, L., Godin, L., Harris, L.B., Kontopoulou, M. (2016), “Rheological and physical characteristics of crustal-scaled materials for centrifuge analogue modelling”, Journal of Structural Geology, 86, 181-199. Zhang, Y., Parent, J.S. Kontopoulou, M. and Park, C.B. (2015), “Foaming of reactively modified polypropylene: Effects of rheology and coagent type”, J. Cellul. Plast., 51 (5-6), 505-522; DOI: 10.1177/0021955X14566209. Nerkar, M., Ramsay, J.A., Ramsay, B.A., Vasileiou, A.A., Kontopoulou, M (2015), “Improvements in the melt and solid-state properties of poly(lactic acid), poly-3-hydroxyoctanoate and their blends through reactive modification”, Polymer, 64, 51-61. Osazuwa, O., Kontopoulou, M., Sabat, R.G., Docoslis, A. (2015), “Electrified polyolefin/multiwall carbon nanotube composites exhibit dramatic changes in electrical conductivity, permittivity and filler structure”, Macromol. Mater. Eng., 300 (4), 448-457; DOI: 10.1002/mame.201400352. Zhang, Y., Tiwary P., Gui H., Kontopoulou, M., Parent J.S. (2014), "Crystallization of coagent-modified polypropylene: Effect of polymer architecture and cross-linked nanoparticles", Ind. Eng. Chem. Res., 53 (41), 15923–15931. Nerkar, M., Ramsay, J.A., Ramsay, B.A. 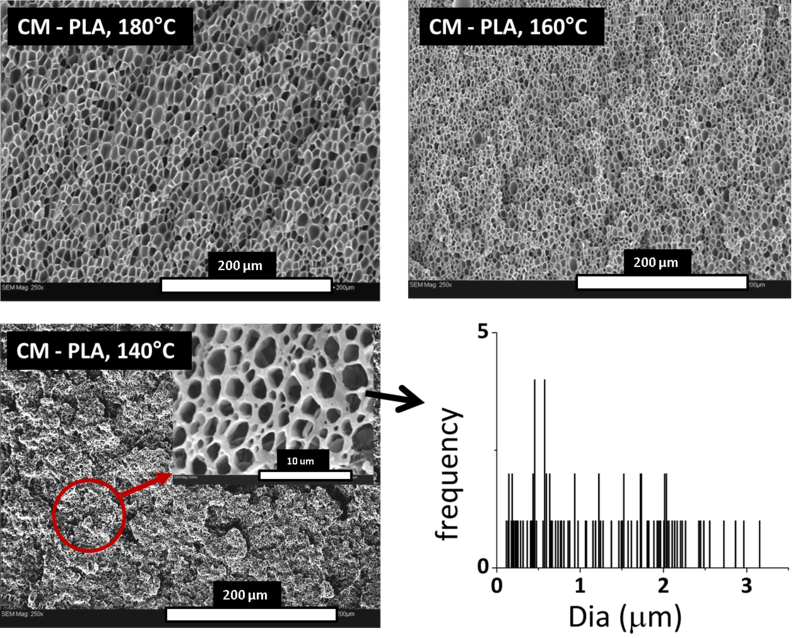 and Kontopoulou, M. (2014), “Dramatic improvements in strain hardening and crystallization kinetics of PLA by simple reactive modification in the melt state”, Macromol. Mater. Eng., 299 (12), 1419-1424; DOI: 10.1002/mame.201400078. Vasileiou, A.A., Docoslis, A. and Kontopoulou, M. (2014), "A non-covalent compatibilization approach to improve the filler dispersion and properties of polyethylene/graphene composites", ACS Appl. Mater. Inter., 6 (3), 1916-1925; DOI 10.1021/am404979g. Kontopoulou, M. (2014), “Advances in Chemically Modified and Functionalized Polymers”, Macromol. React. Eng. 8 (2), 67-68. Nerkar, M., Ramsay, J.A., Ramsay, B.A. and Kontopoulou, M. (2014), "Melt compounded blends of short and medium chain-length poly-3-hydroxyalkanoates", J. Polym. Environ., 22 (2), 236-243. Powell, A., Kontopoulou, M. and Hojabr, S. (2014) “Ethylene Propylene Rubber Polyampholytes and their Blends with Polypropylene as an Alternative to Chemically Cross-Linked Thermoplastic Elastomers and Thermoplastic Vulcanizates”, Macromol. React. Eng. 8 (2), 112-121. Osazuwa, O., Petrie, K., Kontopoulou, M., Xiang P., Ye, Z., Docoslis, A. (2014), “Electrically conducting polyolefin composites containing electric field-aligned multiwall carbon nanotube structures: the effects of process parameters and filler loading”, CARBON, 72, 89-99. DOI:10.1016/j.carbon.2014.01.059. Vasileiou, A.A., Docoslis, A., Kontopoulou, M., Ye, Z. and Xiang. P., (2013) “The role of non-covalent interactions and matrix viscosity on the dispersion and properties of LLDPE/MWCNT nanocomposites”, Polymer, 54 (19), 5230-5240. Zhang, Y., Tiwary P., Parent, J.S., Kontopoulou, M., Park, C.B. (2013) “Crystallization and Foaming of Coagent-Modified Polypropylene: Nucleation Effects of Cross-linked Nanoparticles”, Polymer, 54 (18), 4814-4819. Bailly, M. and Kontopoulou, M. (2013) “Linear viscoelastic properties of ethylene-octene copolymer/nanosilica composites investigated over a broad range of frequencies”, J. Rheol., 57(2), 407-426. Xiang, P., Petrie, K., Kontopoulou, M., Ye, Z., Subramanian, R. (2013) “Tuning Structural Parameters of Polyethylene Brushes on Silica Nanoparticles in Surface-Initiated Ethylene “Living” Polymerization and Effects on Silica Dispersion in a Polyolefin Matrix”, Polymer Chemistry (4), 1381-1395. DOI 10.1039/C2PY20722B. Moraes, R.P., Smeets, N.M.B., McKenzie, N., Zhang, Y., Kontopoulou, M., Ramsay, B., Ramsay, J.A., McKenna T.F.L. (2013) “Reactive mcl-PHA: A Sustainable Alternative for Innovative Hybrid Materials”, Macromol. Mat. Eng., 298, 1004-1015. Nerkar, M., Ramsay, J.A., Ramsay, B., Kontopoulou, M, Hutchinson, R. (2013) “Determination of Mark-Houwink parameters and absolute molecular weight of medium-chain-length poly(3-hydroxyalkanoates)”, J. Polym. Environ., 21 (1), 24-29. DOI: 10.1007/s10924-012-0525-3. Vasileiou, A.A., Papageorgiou G.Z., Kontopoulou, M., Docoslis, A., Bikiaris, D. (2013) “Covalently bonded poly(ethylene succinate)/SiO2 nanocomposites prepared by in-situ polymerization”, Polymer 54, 1018-1032. Osazuwa, O., Petrie, K., Kontopoulou, M., Xiang P., Ye, Z., Docoslis, A. (2012) “Characterization of non-covalently, non-specifically functionalized multi-wall carbon nanotubes and their melt compounded composites with an ethylene-octene copolymer”, Comp. Sci. Technol. 73, 27-33. Lee, S.H., Bailly, M., Kontopoulou, M. (2012), “Morphology and properties of polypropylene/ethylene-octene copolymer blends containing nanosilica”, Macromol. Mat. Eng., 297 (1), 95-103. Tang, L., Yan, X., Kontopoulou, M., Docoslis, A. (2011), "The effect of electric field parameters on the resisitivity and induced percolation time of carbon black-filled polystyrene composites," Polymer Composites 32 (7), 1106-1114. Zhai, W.T., Park, C.B., and Kontopoulou, M. (2011),"Addition of Nano-Silica Dramatically Improving Cell Morphology and Expansion Ratio of Block Polypropylene Copolymer Foams Blown in Continuous Extrusion”, Industrial & Engineering Chemistry Research, 50 (12), 7282-7289. Petrie, K., Vasic, S., Kontopoulou, M., Docoslis, A., Morgan, S., Ye, Z. (2011), “Non-covalent/Non-specific Functionalization of Multi-Walled Carbon Nanotubes with a Hyperbranched Polyethylene and Characterization of their Dispersion in a Polyolefin Matrix”, CARBON Letters, 49 (10), 3371-3391. Lee, S.H., Kontopoulou, M., Park, C.B., Wong, A. and Zhai, W. (2011), “Optimization of Dispersion of Nanosilica Particles in a PP Matrix and Their Effect on Foaming”, Intern. Polym. Process., 26 (4), 388-398. Zhang, Y., Kontopoulou, M., Ansari, M., Hatzikiriakos, S.G., Park, C. B. (2011), “Effect of molecular structure and rheology on the compression foam moulding of ethylene-α-olefin copolymers”, Polym. Eng. Sci., 51 (6), 1145-1154. Fam, H., Kontopoulou, M., Bryant, J.T. (2011), “Method for friction estimation in reciprocating wear tests”, Wear, 271 (5-6), 999-1003. Bailly, M., El Mabrouk K., and Kontopoulou, M. (2010), “Effect of Polymer/Filler Interactions on the Structure and Rheological Properties of Ethylene-Octene Copolymer/ Nanosilica Composites”, Polymer, 51 (23), 5506-5515. Vassiliou, A.A., Bikiaris, D., El Mabrouk, K., Kontopoulou M. (2010), “Effect of evolved interactions in poly(butylene succinate)/fumed silica biodegradable in situ prepared nanocomposites on molecular weight, material properties and biodegradability”, J. Appl. Polym. Sci., 119 (4), 2010-2024. Lee, S.H., Kontopoulou, M., Park C.B. (2010), “Effect of Nanosilica on the Co-continuous Morphology of Polypropylene/Polyolefin Elastomer Blends”, Polymer, 51 (5), 1147-1155. Lee, Y.H., Kuboki, T., Park, C.B., Sain, M., and Kontopoulou M. (2010), "The Effects of Clay Dispersion on the Mechanical, Physical, and Flame-Retarding Properties of Wood Fiber/Polyethylene/Clay Nanocomposites", J. Appl. Polym. Sci., 118 (1), 452-461. 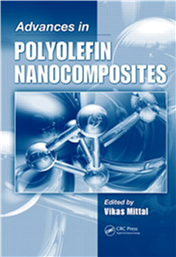 Bailly, M. and Kontopoulou, M., “Nanocomposite blends containing polyolefins”, in Advances in Polyolefin Nanocomposites, ed. V. Mittal, CRC Press, Taylor and Francis Group, 2011 (invited contribution). Kontopoulou M. (ed. 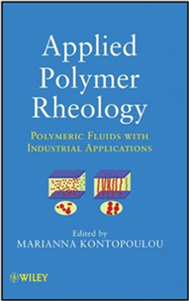 ), “Applied Polymer Rheology: Polymeric Fluids with Industrial Applications”, John Wiley and Sons, New York, 2012. Research projects undertaken to date include blends containing metallocene-catalyzed polyolefins; thermoplastic olefin blends (TPOs) and thermoplastic vulcanizates (TPVs); polyolefin nanocomposites; biopolymer-based blends and composites; thermoplastic elastomers; polymer joining techniques, such as vibration and laser welding; powder processing technologies, such as rotational molding; alignment of conductive fillers in electrically conductive polymer composites; and rheological properties of fluids in biomedical applications. Polymer nanocomposites, which combine superior engineering properties with desirable traits such as light weight, ease of manufacturing and recyclability are of major scientific and technological importance. Specifically conductive polymer/matrix composites are expected to make a big technological and commercial impact in applications where electrical conductivity, superior heat conduction, and mechanical robustness are desired material attributes. Applications of conductive composites can be envisioned in fire retardant additives, high-strength composites, electromagnetic interference shielding, energy storage devices, wearable sensors, electro-mechanical actuators, coatings suitable for electrostatic painting etc. Additive manufacturing, also known as 3D printing, has seen explosive growth in recent years and has been touted as a replacement for traditional manufacturing, offering great flexibility in the way products are developed and produced. Polymers in various forms, including liquid solutions and thermoplastic melts, can be used to manufacture a wide variety of products. At the forefront of this research is the quest for biobased and biodegradable polymeric materials, to ensure the sustainable character of additive technologies. 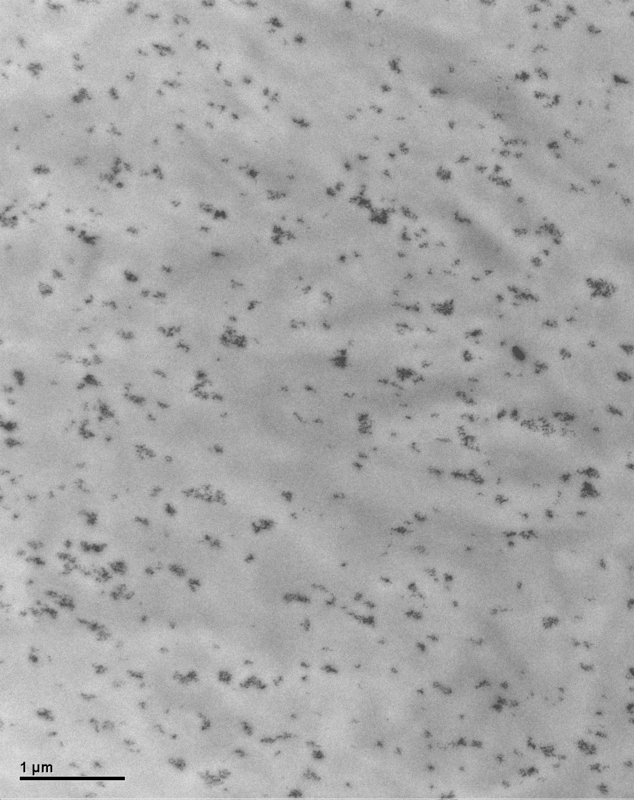 The purpose of our research is to develop new biodegradable thermoplastic biopolyester formulations for use in 3D-Bioplotting®, which is a specialized additive manufacturing equipment for biomedical applications, offering the advantages of solvent-free, continuous manufacturing to produce scaffolds, fibrous mats for tissue engineering, and potentially other types of fibrous structures. Past industrial projects have included include the development of thermoplastic materials for packaging, hot melt adhesives, automotive applications and foams. 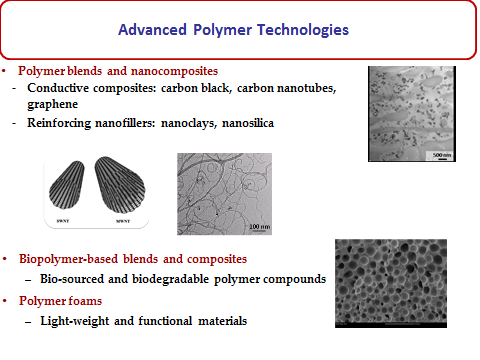 Current industry funded research includes the development of thermoplastic composites using environmentally friendly mineral fillers to improve mechanical properties, such as flexural modulus and impact strength, while reducing the cost of the compounds; developing environmentally friendly methods to achieve graphite exfoliation; development of thermoplastic/graphite and graphene composites suitable for automotive applications.